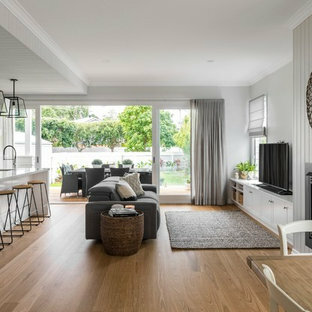 This is an example of a contemporary formal enclosed living room in Melbourne with white walls, light hardwood floors, a standard fireplace, no tv and beige floor. 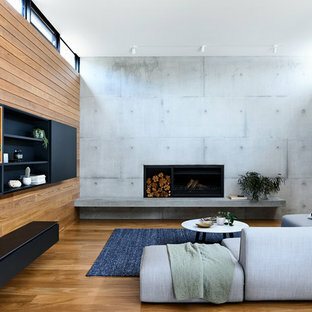 Photo of a contemporary formal open concept living room in Melbourne with medium hardwood floors, a standard fireplace, a concrete fireplace surround, grey walls and brown floor. 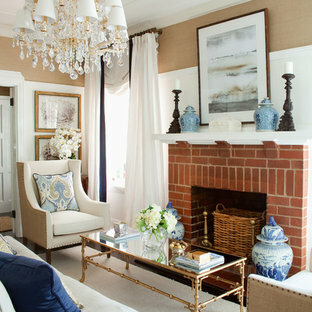 Photo of a transitional formal enclosed living room in Perth with white walls, carpet, a standard fireplace, a wood fireplace surround and no tv. Transitional open concept living room in Brisbane with grey walls, medium hardwood floors, a standard fireplace, a freestanding tv and brown floor. 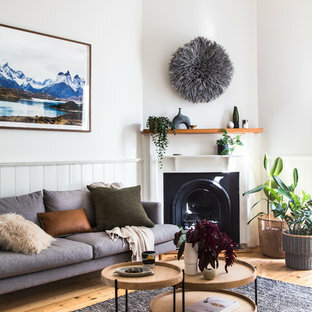 This is an example of a scandinavian open concept living room in Melbourne with white walls, light hardwood floors, a standard fireplace, a metal fireplace surround and brown floor. 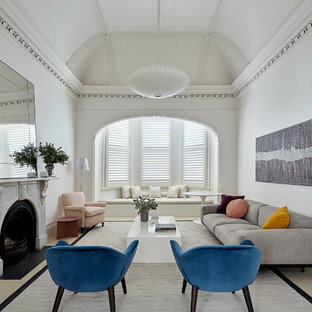 Photo of a contemporary living room in Sydney with no tv, grey walls, light hardwood floors, a standard fireplace and beige floor. Design ideas for a transitional living room in Melbourne with white walls, carpet, a standard fireplace and a stone fireplace surround. 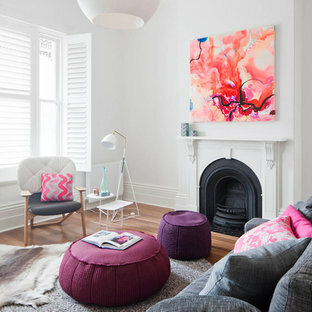 Photo of a contemporary living room in Melbourne with white walls, dark hardwood floors, a standard fireplace and brown floor. This is an example of a beach style enclosed living room in Gold Coast - Tweed with white walls, dark hardwood floors, a standard fireplace and brown floor. 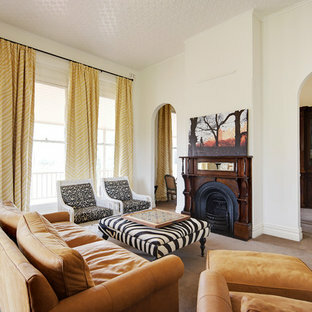 Photo of a mid-sized beach style open concept living room in Sydney with white walls, dark hardwood floors, a standard fireplace and brown floor. Inspiration for a large transitional formal living room in Perth with white walls, dark hardwood floors, a standard fireplace, a concrete fireplace surround, brown floor and a freestanding tv. Inspiration for a beach style living room in Sydney with white walls, medium hardwood floors, a standard fireplace and brown floor. This is an example of a beach style open concept living room in Perth with white walls, medium hardwood floors, a standard fireplace, a stone fireplace surround, a freestanding tv and beige floor. 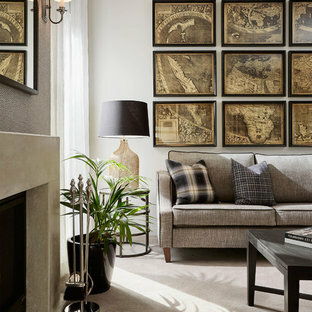 Inspiration for a mid-sized transitional open concept living room in Sydney with grey walls, light hardwood floors, a standard fireplace, a stone fireplace surround and brown floor. This is an example of a contemporary open concept living room in Melbourne with white walls, medium hardwood floors, a standard fireplace, a brick fireplace surround, a freestanding tv and brown floor. Mid-sized contemporary formal open concept living room in Melbourne with white walls, concrete floors, a standard fireplace, a metal fireplace surround and beige floor.